Come celebrate the beauty of Holland and old-world Flanders in springtime. Cruise for seven nights aboard the exclusively chartered, deluxe, small river ship Amadeus Brilliant when the vibrant Dutch tulip fields are in bloom. Meet local residents during the exclusive River Life® Forum for a personal perspective of daily life and cultural heritage in the Low Countries. Expert-led excursions include the historic canals of Amsterdam, storybook Bruges, the world-class Kröller-Müller Museum, famous Keukenhof Gardens, Hoorn, Maastricht and Antwerp. 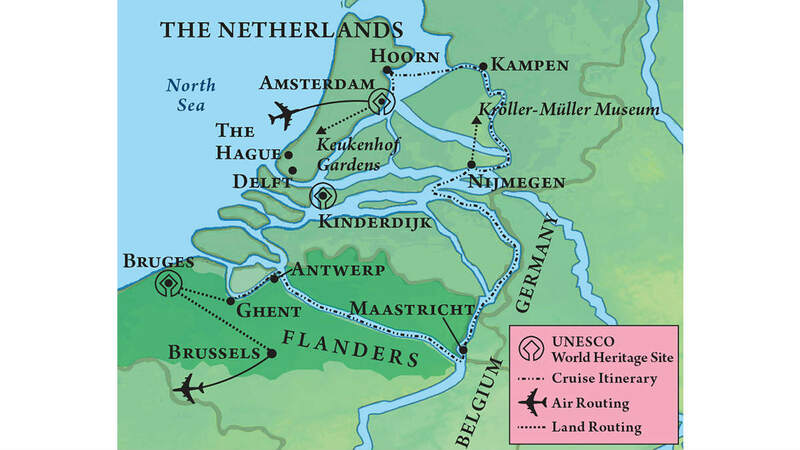 Amsterdam Pre-Cruise Option and the Delft, Kinderdijk and The Hague Post-Cruise Option are offered. This comprehensive itinerary is continually praised as the ideal Dutch and Flemish experience.